According to Omron Automation, it makes good business sense to use regenerative drive technologies on motor loads to reduce a machine’s energy consumption. Studies show that Omron’s regenerative drive solutions can reduce electrical energy consumption by up to 50%, according to the application. Omron tunes its regenerative drive units specifically to match their inverter product range. When used in combination with harmonic and EMI filters, they ensure the regenerated AC energy is a perfect sine wave. 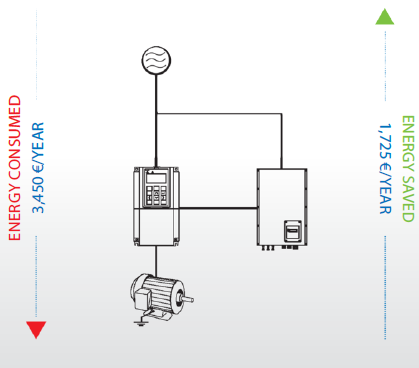 Compared to resistance braking, the modules are smaller, have a better performance, and can used 1:1 or 1:n.
Regenerative variable speed drives work by recovering the braking energy of a load and returning it to the power system, creating less heat; reducing power consumption, and simplifying the installation. Typical applications include all types of cranes, unwinders, hoisting applications and discontinuous centrifuges. Savings will depend on the application’s loads and cycle frequencies, but OEMs offering a regenerative solution on their machine can save their customers a substantial amount of money, which makes their machines more attractive. Benefits of regenerative units include lower energy costs by reusing the energy; flexible single or multi-drive configurations, and clean energy. A crane, for example, with a braking power of 16 kw and a frequency of 18 cycles per day will save enough money to pay for their regenerative solution in year one of operation. After that, it’s free energy. Omron offers different configurations to ensure the best fitting regenerative solution for the application. In one configuration, regenerated energy supplies other drives. In the other, it feeds other components in the same power supply circuit. Inverters generate high harmonic distortion, that may cause malfunctions in other electronic components. When advanced harmonic filters are used, the energy regenerated by the Omron harmonic solutions are clean and do not damage other electrical components. Applications requiring clean energy with a harmonic distortion of less than 5% include medical systems and laboratory applications.